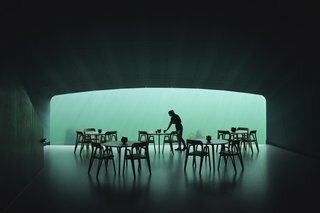 While dining deep isn’t exactly new—there are several underwater restaurants around the world—they’re mainly held in aquariums or other controlled environments. 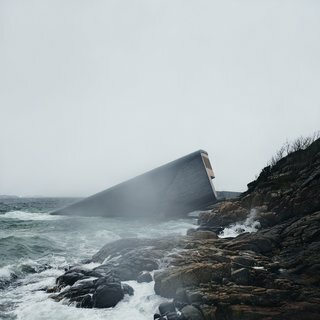 By contrast, the Snøhetta-designed Under, which opened this week in Lindesnes, Norway, sits in the wild, icy North Atlantic, perched seemingly precariously on a rocky coastline. Seafood comes with an undersea view at Norway's Under restaurant. "Under is a natural progression of our experimentation with boundaries," says Kjetil Trædal Thorsen, founder of Snøhetta. "[It] proposes unexpected combinations of pronouns and prepositions, and challenges what determines a person’s physical placement in their environment. In this building, you may find yourself under water, over the seabed, between land and sea. This will offer you new perspectives and ways of seeing the world, both beyond and beneath the waterline." 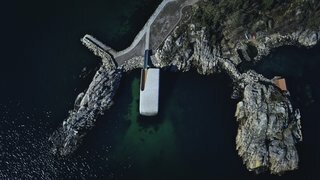 Under sits on the seabed as well as the rocks of the Norwegian coastline. The design is a tilted concrete tube that gives the impression of sliding into the sea. "The idea was to make a tube that would bring people from above sea level down under the sea," lead architect Rune Grasdal told Dezeen. "That transition is easy to understand, but it’s also the most effective way to do it. 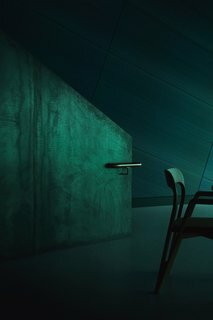 It also feels secure, but you don’t feel trapped." The angle was also designed with the building’s aquatic neighbors in mind. It’s hoped that, in time, the structure will become part of its environment, acting as an artificial reef. Marine research is part of the project: cameras and other measurement tools have been installed outside the restaurant to help researchers learn about the population, behavior, and diversity of the species living in this part of the North Atlantic. Local carpentry workshop Hamra designed the furniture for the restaurant. The dining experience at Under is created by two-time Michelin-starred chef Nicolai Ellitsgaard, originally from Denmark. His "Immersion" menu is a tasting menu comprised of around 18 locally sourced seafood delicacies. Cameras and other measurement tools have been installed outside the restaurant to help researchers learn about the population, behavior, and diversity of the species living in this part of the North Atlantic. "Fresh ingredients and pure, naked flavors are of utmost importance to us," says Ellitsgaard. "At the same time, we want to provide a unique dining experience that ushers our guests beyond their current comfort zone." The tasting menu with wine will set you back about 4 hours and around $400 per person, but you’ve got time to save up. The restaurant is already booked through September.